You can feel Berlin’s 24/7 currents flowing around Ohmstrasse. Situated in the gritty edge of Mitte, once the heart of communist East Berlin, the street is loomed over by a vast power station complex and embedded in an industrial area that is home to legendary clubs such as Tresor and KitKat. Parts of Kreuzberg, long a vibrant multi-ethnic borough of West Berlin, lie paradoxically just to the east. Yet the short street, named after the German physicist Georg Ohm who explained electrical current, is a haven of calm. Parking is forbidden, it is leafy and there are bourgeois houses from the Wilhelminian period of a century ago. Now, they are joined by a new townhouse called the vGGG Building, by Berlin-based architecture practice Gonzalez Haase. French architect Pierre Jorge Gonzalez met Dutch designer Judith Haase in upstate New York in 1996 when converting the Watermill Center into a cultural centre for experimental theatrical director and artist Robert Wilson. The practice Gonzalez Haase has since created a string of galleries, flagship stores and conversions characterised by clear, clean spaces and surfaces. At Ohmstrasse, it took on the job of designing a residential building within strict city regulations that protect the unique street. Max Von Gumppenberg (known for his lo-fi fashion photographic work with Patrick Bienert) had found the site in 2011, when war-time gaps between buildings in central Berlin were getting snapped up fast. This one was just 13m wide. He, Gonzalez and supermodel Luca Gadjus formed a ‘Baugruppe’ to jointly develop the building. Gadjus and Von Gumppenberg would take one residence and Gonzalez another. Rather than any particular style, Gonzalez says the design inspiration was how the Haus Wittgenstein in Vienna was built in the Twenties by obsessional-perfectionist architect Ludwig Wittgenstein. It’s ‘more the process, how you come to the project’, he says. The vGGG Building, named after the developers initials, has five storeys rising to 17m, with three residential units. This being Berlin, graffiti immediately appeared above the strip of travertine marble that runs below the plaster of the street facade. Recessed windows punctuate the facade, symmetrically arranged from the its centre, but varying in width and frame arrangement. The structure is concrete, which is exposed internally, starting in the central common stairs. There, the material is unadorned but for a minimal bannister of galvanised steel and metal mesh where staircases have an open side. ‘It’s not minimalism, it’s minimised,’ says Gonzalez. His residence is one of two that rise to the top of the building. Below it, the third unit was built for market, and the other side of the building is occupied by Von Gumppenberg. Because they’re multi-storey, these units have their own internal stairs, which can cut across the side of the otherwise orthogonally shaped rooms. In the heart of the building, there are 50cm clerestory gaps below the ceiling to allow natural light to pass from the east or west sides — they will be glazed. In some rooms, metal service pipes run up beside raw concrete walls, giving an industrial edge. 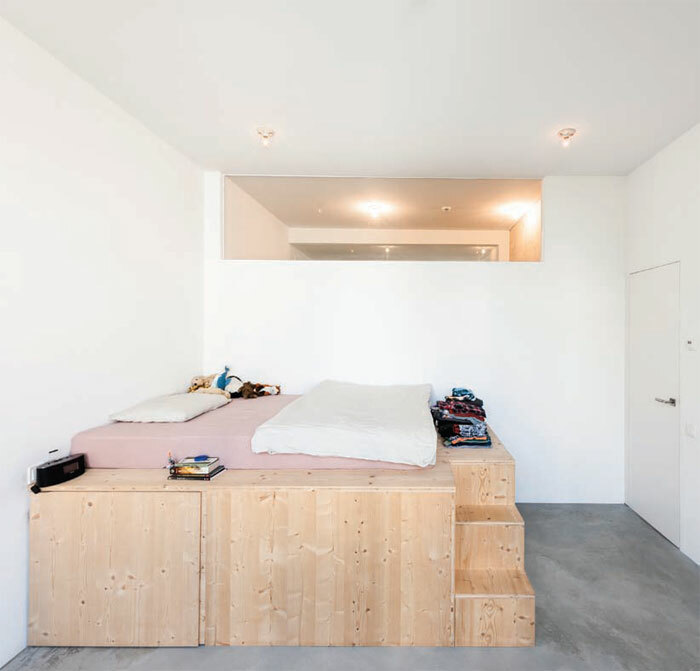 The Gonzalez residence has three bedrooms with wooden fixtures designed by the practice, such as a riser for beds that incorporates storage and a few steps, and open-sided storage facilities. But the room that takes your breath away is the fourth floor living room-kitchen. The space is airy, full of light, and big enough for a full-on party. It stretches from a limestone-paved patio terrace on the street side to a huge window opposite with a view right into the heart of the power station complex. That window is actually an adaption of the full-width sliding screen doors opening on to the patio. All vGGG windows have massive larch frames and are customised for the rooms they belong to, hence their variation in shape and operation. Some slide, some tilt, some open like a concertina. 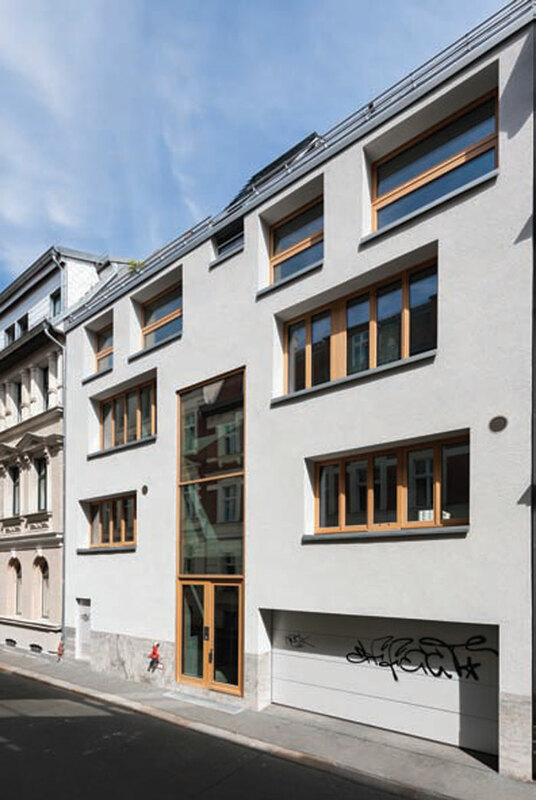 Gonzalez says the building is ‘full of compromises’ to comply with strict city specifications that preserve the character of Ohmstrasse, such as the height of the eaves. Behind the cornice is the living room’s patio, but a metal staircase with covering canopy rises further from it to the roof terrace, bordered with low grey walls. From here, the full scale of the power station complex is apparent. A plant was built in the Sixties to provide heating and power to East Berlin, but now hosts clubs and events in a space called simply Kraftwerk (Power Station). An adjacent, larger CHP building, the Heizkraftwerk Mitte, designed by versatile veteran Frankfurt-based architect Jochem Jourdan, replaced the old power station in 1996. 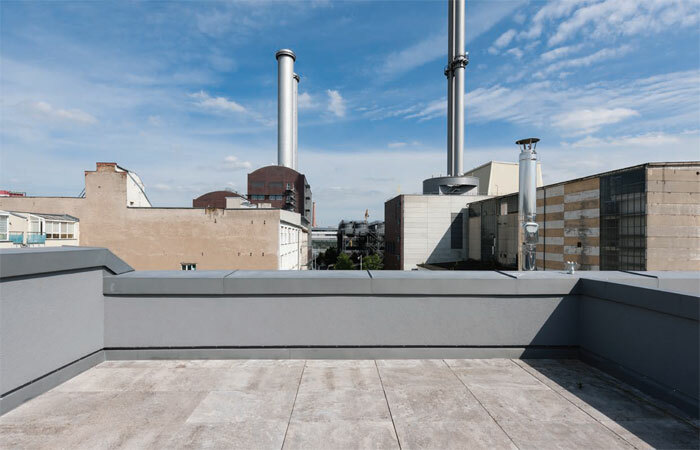 Its 100m-high flue stacks are metallic high-tech, which is echoed in the vGGG Building’s shiny stainless-steel chimney emerging above the roof terrace. The von Gumppenberg residence has the same upper configuration as that of Gonzalez, but it extends down the full depth of the building. That enables different spaces to open up on the lower floors. A study looks into an internal void open to the large dining room area below, enabling a 6m-high sculpture, Nebukadnezar (2011) by Gregor Hildebrandt to rise into it, beside a Mangiarotti table with stone selected by Gonzalez Haase. 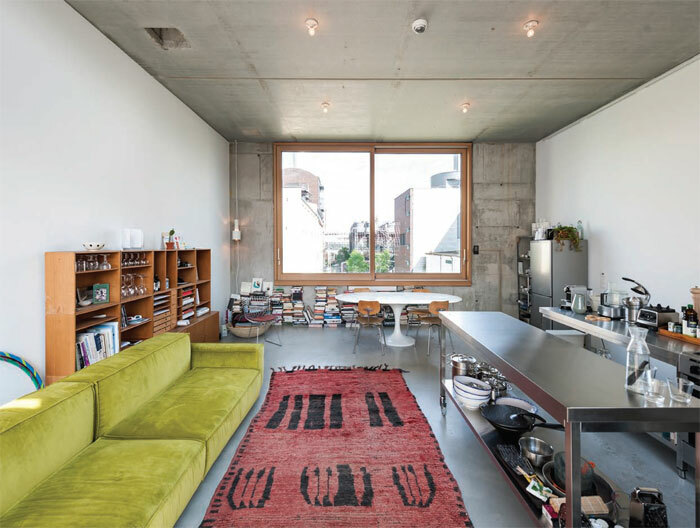 This dining room is overlooked by a mezzanine kitchen on one side, and a terrace patio on the other, which extends from the building — stairs are planned to descend from it into the garden. The terrace arrangement is mirrored in the third residence, and will be separated by a wall growing herbs. The garden itself extends to the border of the power plant site, and a wooden screen along it is planned. On the outside, this project is about communicating with different faces of Berlin — a genteel street and a giant plant. The interior is different. It has a minimalist feel, but warmed by its wooden features. Brutalists expressed form in concrete, but Gonzalez Haase sculpted internal space from it, from intimate nooks to large, airy spaces, all of which invites family life. 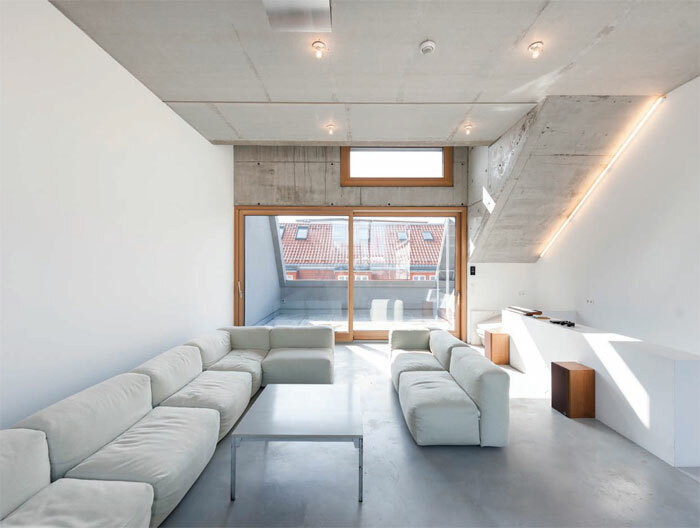 Gonzalez describes the concrete as ‘super-raw, you see the reality of the substance of the building’. And, along with its edge of industrial elements, it resonates with the rough, robust nature of the city itself. The dialogue with Berlin is internal as well as outside.